CAMP co-director, Tone Olaf Nielsen, in an interview with Bashy Quraishy in Bashy's Corner about CAMP and Trampoline House: Copenhagen Refugee Community, TV København, June 22, 2017, 28:32 min. Video feature about CAMP by Clemens Bomsdorf for C&, May 2015, 2:48 min. Video feature about Camp Life: Artistic reflections on the politics of refugee and migrant detention, Apr. 17 – June 14, 2015. Video by Rune Alexander Birkvad Sørensen, 2:18 min. Video feature about from the mountains to the valleys, from the deserts to the seas: journeys of historical uncertainty – a solo show by Tiffany Chung, Sept. 25 – Dec. 12, 2015. Video by Rune Alexander Birkvad Sørensen, 1:41 min. Video feature about The Dividing Line: Film and Performance About Border Control and Border Crossing, Mar. 4 – June 18, 2016. Video by Rune Alexander Birkvad Sørensen, 2:04 min. Video feature about Deportation Regime: Artistic responses to state practices and lived experience of forced removal, Sept. 9 – Dec. 16, 2016. Video by Rune Alexander Birkvad Sørensen, 2:16 min. Video feature about Migration Politics: Three CAMP exhibitions at the SMK, Sept. 10 – Nov. 6, 2016. Video by SMK: National Gallery of Denmark, 1:57 min. Video feature about We shout and shout, but no one listens: Art from conflict zones, Mar. 3 – June 17, 2017. Video by Habib Mohseni, 5:06 min. Video feature about Economy of Migrant Labor – for the Right to Work, Jan. 19 – May 19, 2018. Video by Danial Ulacia, 3:49 min. "What is the role of museums in a world on fire?" / debate at SMK: National Museum of Denmark that CAMP's directors took part in, June 21, 2017. 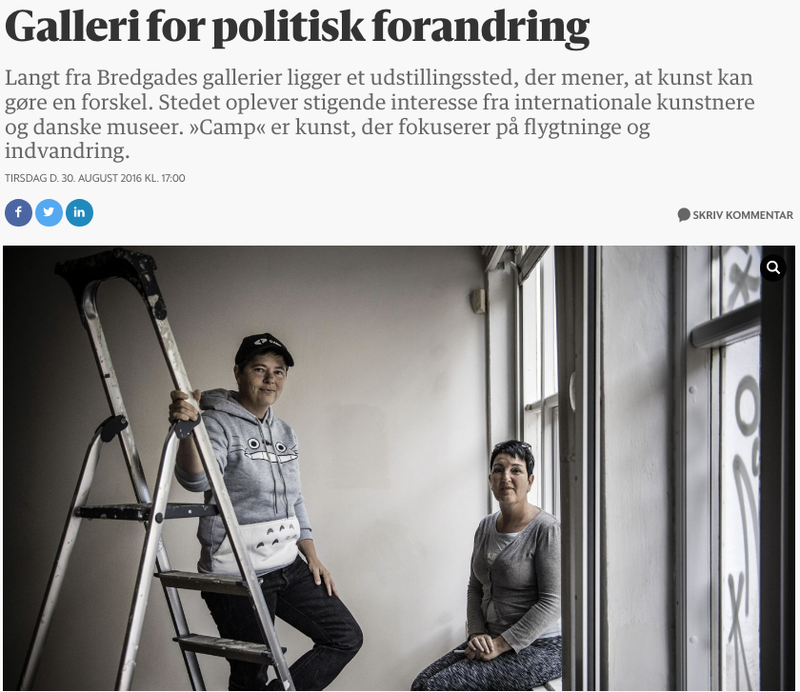 Thomas Westergaard, “Nyt udstillingssted fokuserer på migrationspolitisk kunst” / radio feature about CAMP, P1 Eftermiddag, April 17, 2015. 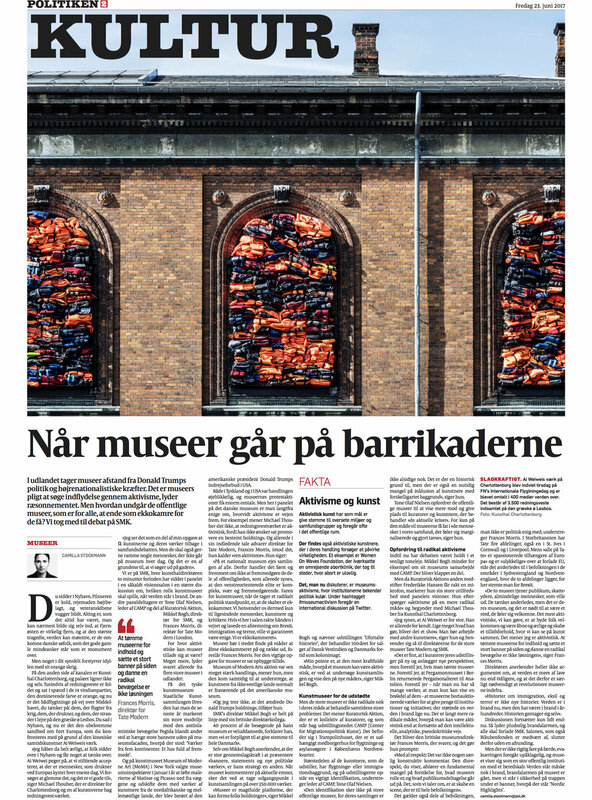 Clemens Bomsdorf, “Danish art space dedicated to refugees opens amid recent migrant tragedy” / The Art Newspaper, April 23, 2015. Clemens Bomsdorf, “Interview: Without words, they communicate what people must endure…” / C&, May 2015. "CAMP: A Unique Center For Art Engaging Migration" / Border Criminologies, March 27, 2017. Mathias Danbolt, "Without Emotional Life Jackets" / Kunstkritikk, June 6, 2016. Alix Rothnie, "Curating the Border between Aesthetics and Action" / Curatingthecontemporary.org, May 7, 2017. Felix Wilks, “Urgent Times: What role can artists play in the refugee crisis?” / review in Happening, October 21, 2016. Kalle Brolin, “Konst som granskar asylpolitiken" / Skånes Fria, June 18, 2015. Lærke Cramon, “Kunsten kan minde os om, at hver flygtning er et menneske” / Information, April 24, 2015. Ole Bak Jakobsen, “Nyt udstillingssted for migrationspolitisk kunst” / Kunsten.nu, April 14, 2015. Mathias Kryger, “Ud af lejren” / Kunstkritikk.dk, April 16, 2015. Ida Marie Hede, "Kollektive kræfter skal grave os ud af det koloniale rod" / Dagbladet Information, September 28, 2018. Respons, “Roskilde satte i år fokus på migrantarbejderes rettigheder” / Respons, October 2, 2018. Mille Højerslev Nielsen, “Fuldkommen menneskelig i en umenneskelig verden” / in-depth review at kunsten.nu, October 24, 2018. Serena Hebsgaard, “Jeannette Ehlers: Afkolonisering begynder med bevidstgørelse” / interview at Eftertryk, January 14, 2019. Nicholas Mierzoeff, “‘Social Death’ in Denmark” / article in The Nation, January 20, 2019. Mikkel Bolt, "Deltagelseskunst er et røgslør" / Weekendavisen, December 2, 2016. Matthias Hvass Borello, “Mennesker uden værdi" / Kunsten.nu, June 10, 2015. Matthias Hvass Borello, “Kunstens flygtningekommisær" / Kunsten.nu, October 14, 2015. Matthias Hvass Borello's award motivation for nominating CAMP for the Danish Art Critics Award 2016. Mathias Danbolt, “Uten følelsesmessige redningsvester” / Kunstkritikk, May 20, 2016. Søren Martinsen, "Ud af museet og ind i virkeligheden" / Kunsten.nu, September 4, 2017. 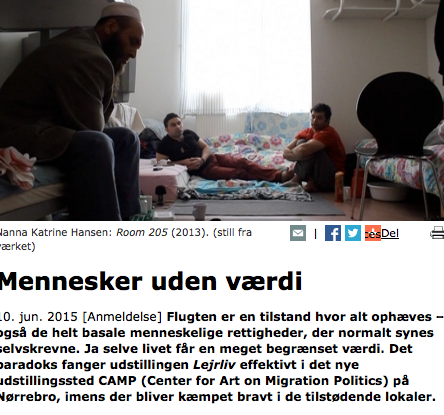 “Nyt center sætter fokus på migrationspolitisk kunst” / Globalnyt.dk, April 13, 2015. Camilla Stockmann, "Når museer går på barrikaderne" / Politiken, June 23, 2017.